Sturgeon’s Law – Science fiction author Theodore Sturgeon was once asked why so much of science fiction literature was terrible. He is reported to have replied, “90% of everything is crap!” His point being that since 90% of all writing is poopoo-caca then it shouldn’t be surprising that so much science fiction writing is bad. 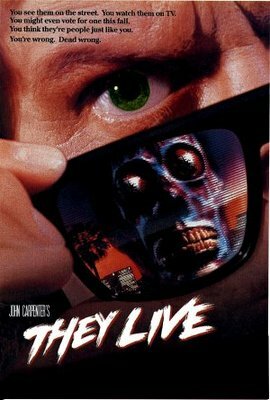 This has come to be termed Sturgeon’s Law and many have tried to say that John Carpenter’s They Live is an example of this law, but no matter how you slice it…this movie is a cult classic. It’s buddy picture like Lethal Weapon. It’s got lots of shoot ‘em ups like Rambo. It’s got humor (the aliens look ridiculous). It’s got goofiness…best line: “Either put on these glasses or start eating that trashcan!” It’s got a WrestleMania smack down right in the middle of the movie. There’s explosions and gun fights. It’s got the John Carpenter throbbing pulsing soundtrack we’ve come to know and love from his movies. Is it crap…you betcha, but John Carpenter crap is still more entertainment for the buck than most directors with ten times the budget these days. He filmed this whole movie for around 4 million. It’s just creepy plain old fun with a little satire on republicans’ greed. Once the lead finds some special glasses with which he can see the real world the aliens have created he sees subliminal messages everywhere. The best one is when he looks at some money being held by another guy and writing on the money is “This Is Your God.” Classic stuff. This movie, for me, doesn’t fall under the Sturgeon’s Law category because it made me laugh, and I don’t laugh at crap. At least not since I was three. Here's the short story Carpenter based thefilm on. Enjoy!